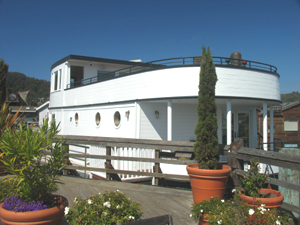 The SS Maggie in Sausalito is a 125-year-old, three-story Steam Schooner that sits high on the docks with a view of San Francisco Bay and Mt Tamalpais. The former captain's wheelhouse is now the dining room. The master bedroom is the old engine room. 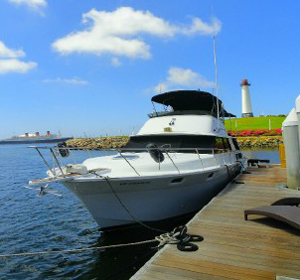 The fully-renovated boat includes a full kitchen, three fireplaces, 3 bedrooms, 3 bathrooms and it sleeps 6. Fill it up with friends, share the cost and it's not much more expensive than a moderately-priced San Francisco hotel. Spend the night on a yacht! Imagine owning your own yacht, even if for just a night. 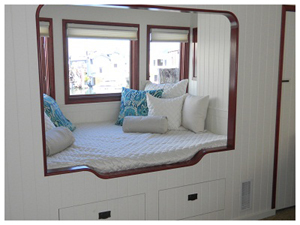 This dockside boat-and-bed is a B&B experience on one of several private yachts located in beautiful Rainbow Harbor, Long Beach. This is a perfect spot to celebrate a birthday or anniversary, or just a night away. Every boat in their fleet is appointed with comfort in mind, with all the amenities one would find in a hotel suite from crisp linens to fluffy white towels. All of the yachts have refrigerators, freezers, coffee makers, microwaves and toasters. A gas BBQ is available on the dock for cooking dinners (no stoves or ovens are available on the boats). A Continental breakfast of assorted pastries, fresh fruit, yogurt and orange juice is delivered to the boat in the morning. Live large without having to hoist a sail! The Delta King Hotel in Old Sacramento is a unique Sacramento treasure. Today it is a beautiful riverboat hotel with modern lodging amenities, 2 outstanding restaurants, 2 professional theaters, a wine school and exceptional facilities for weddings, banquets, and meetings. But it wasn't always a hotel. This historic 285-foot-long paddlewheel steamboat is the sister ship to the Delta Queen, both christened 20 May 1927. It traveled between Sacramento and San Francisco on 10-hour trips for many years, and in their day, both boats were the most lavishly-appointed and expensive sternwheel passenger boats ever commissioned. The completion of the Golden Gate Bridge and Bay Bridge in 1937 and 1938 spelled the doom of the California river boat. By 1940 the King and Queen were out of business and readied for transport to New York. Then the war broke out. Both the King and Queen were drafted into the U. S. Navy to serve on San Francisco Bay as net tenders, floating barracks, troop transports and hospital ships. At the conclusion of the War, the Delta Queen was purchased by the Green Line Steamers of Cincinnati and taken, via the Panama Canal, to the Mississippi River where she served as the flagship of the Delta Queen Steamboat Company. Today the Delta Queen is located at Chattanooga, TN, serving as a hotel and restaurant. 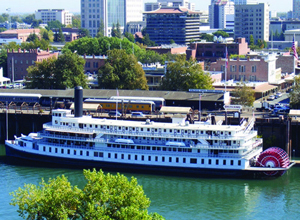 In 1984, after being partially submerged for 15 months in San Francisco Bay, the Delta King was acquired privately and towed to Old Sacramento where it underwent a complete historical renovation. 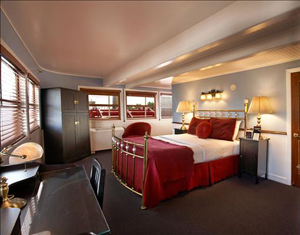 As its current duty today, Delta King is moored in Old Sacramento as a lovely 44-room hotel.